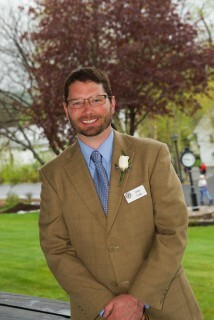 Sven Cole is the Assistant Head of School, a role he has held since 2012. Prior to that, Sven served as Director of Institutional Advancement, where he provided oversight for Admissions, Development and Marketing. His first job at Bridgton Academy came back in the 1980’s when he was in middle school and worked in the dish room of Goldsmith Dining Hall. Sven is a third-generation Bridgton Academy staff member, the son of Bridgton Hall of Fame member Susan Cole and grandson of Bridgton Hall of Fame member Betty Dyer. Needless to say, he has some impressive shoes to fill. Prior to returning to the Bridgton Academy community, Sven was the Director of Marketing for Glen Group, a marketing firm in New Hampshire. Sven lives on campus with his dog, Summit. In his down time he enjoys catching sunrise from the top of Pleasant Mountain; he works hard to bring a few students up with him each year to experience the dawn of a new day from the mountaintop.